Our new sweet pea stamp was a perfect image to use for this birth announcement. We stamped the medium block in Colorbox pink to start this card. 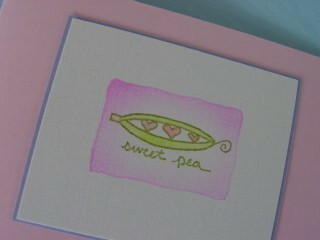 We stamped the sweet pea stamp using the olive Impress pad. The three little hearts were colored in with a pink Prismacolor pencil.